is Leena Kela and Kristina Junttilas performance- and script writing project where coffee exercises take different forms. 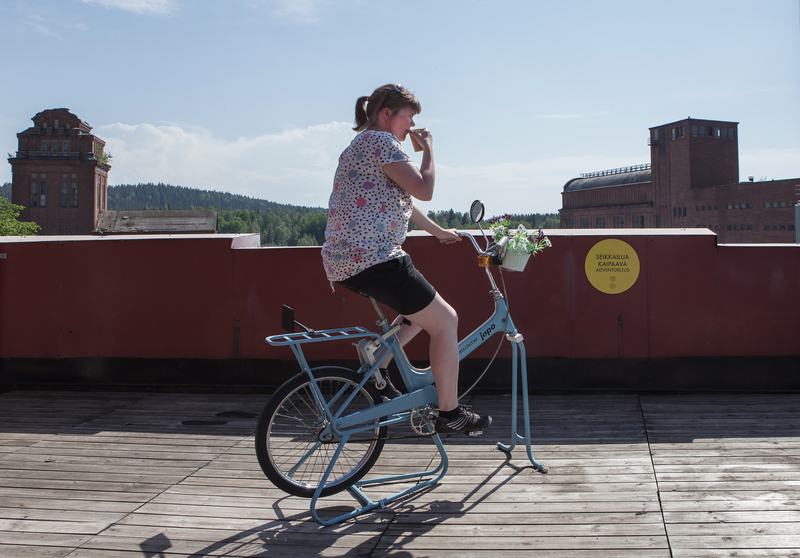 Kahviland has until now taken three different forms; first as several tours where we sat up a laboratory in four different museums or art halls for one week, the second was a book publication and the third was an installation at the Mänttä Art Festival. Kahviland write and perform coffee exercises. A coffee exercise is a written instruction or suggestion for a coffee performance – based on the Fluxus tradition. The exercise can be performed either alone, with someone else, or you can even see it just as a performance aphorism. Coffee is the only necessary ingredient. Curator: Minna Joenniemi, Graphic Design:Â Ainoa Graphic Design, iPad application: Tuomas Karmakallio, Technical support: Roope Pellinen, Carpenting support: Hannu Kela, Web page: Tiia Suorsa. Web page photographs: Heikki Vesterinen, Roope Pellinen and Stein Valkoinen. Partner Autobar Finland Oy. Supported by Arts Promotion Centre Finland.